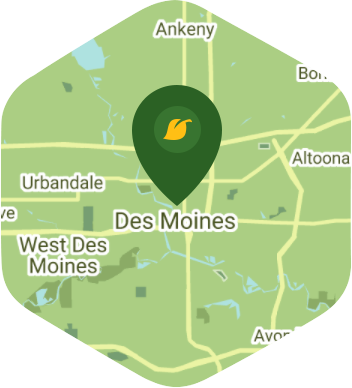 Book a skilled lawn pro in Des Moines. Backed by a total satisfaction guarantee and amazing customer support. You live in Des Moines, the capital of Iowa and one of the most beautiful cities in America. From the Capital State Building all the way to the Greater Des Moines Botanical Garden, you will never run short of beautiful sights and attractions in this fine city. It's a shame that you rarely get to enjoy any of your city's attractions because you're too busy dealing with weeds growing in your garden. Aggressive weeds can really ruin any yard that they grow in, but Lawn Love can handle them for you. Our weed control service is one of Des Moines' best and you can never go wrong with a fully bonded and insured company like Lawn Love. Even the most aggressive of weeds have no chance against our team of independent lawn experts who have been doing weed control for years. We use selective herbicide spot treatment to deal with weeds as it has been proven to be the most effective way of dealing with them. With our affordable rates and convenient online booking system, you can say goodbye to those pesky weeds for good. Give our weed control service a shot by calling us at 515-305-3166 or request a free online quote from us with zero commitment. Wow! He did a wonderful job with my lawn! I am so pleased! Thank you very much. It was so nice to come home and see my lawn looking so good. I will be calling in the spring as well for your help. Thank you Brandon for your hard work! Look forward to using you again! Rated 4.86 / 5 stars in 25 Des Moines customer reviews. There won't be any rain in Des Moines today, which means you'll probably have to water your lawn. Dusk and dawn are the best times to water your lawn (the sun will rise at 6:22 AM and set at 8:03 PM today in Des Moines). Here are some average prices for homes in Des Moines. Average size of area treated 5,354 sq. ft.